A great visual and winner of Gold Lion at the 2006 Cannes awards. 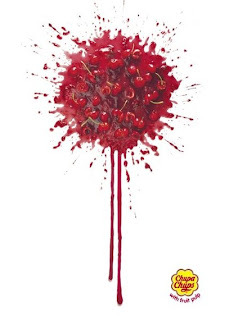 The outdoor campaign aims to convey the massage that chuba chup lollies contain real fruit, by using images of squashed and splashed fruit against a white background. 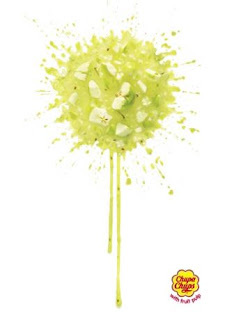 The fruits form the shape of various flavoured lollies and the trails of running juice are used to suggest the lollipop stick. Good use of a simple, white background with the image on top, and simple logo in the bottom right-hand corner, making the splashed fruit the main point of focas. This is also emphasised by the bright colours of the fruit, which really catch the viewers attention. However, whilst clearly demonstarteing the products promise 'Chuba Chup, With fruit pulp', the images do not sell the product well. The image brings to mind vomit before the pulp of a fruit. Not what you want to associate with a food product. I actually really like this camapign...It immediately made me think of the burst of flavour in your mouth. 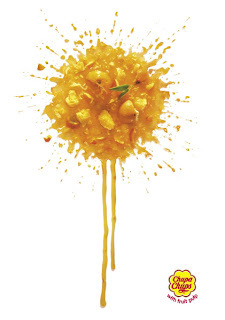 The splattered fruit creates real impact. Simple but effective images.